2 + Hrs DVD New York lecture. This lecture pushes the envelope and stretches the mind in examining the concept of being human. This lecture pushes the envelope and stretches the mind in examining the concept of being human. As technology steps up it is rapidly becoming more essential for humans to examine their potentials, possibilities and capabilities in being more than we have been. This promises to be an eye opening experience and perhaps one that will ring true to your being. 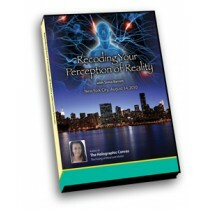 To recode ones perception is to change or reprogram the conditions by which you formulate your life.